Halifax, N.S. 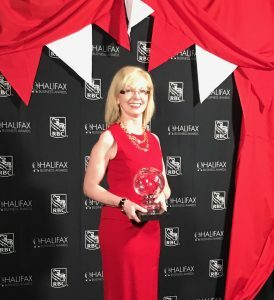 – Joyce Carter, President & CEO of Halifax International Airport Authority (HIAA), has been named the 2019 winner in the Business Leader of the Year category at the Halifax Business Awards, an event put on by the Halifax Chamber of Commerce. Ms. Carter joined HIAA in 1999, and since then she has been integral in HIAA’s growth and development, becoming Chief Financial Officer in 2006, Chief Strategy Officer in 2008, and President & CEO in 2014. She has a Bachelor of Commerce degree from Saint Mary’s University and is a graduate of the Institute of Chartered Accountants of Nova Scotia. In 2012, she was awarded the prestigious designation of Fellow Chartered Accountant (FCA). She obtained the Institute of Corporate Directors (ICD.D) designation in 2015, and was named one of Atlantic Canada’s Top 50 CEO’s by Atlantic Business Magazine in 2017 and 2018. Ms. Carter is a board member of the Airports Council International (ACI) World Governing Board and ACI-North America Board of Directors, is Vice Chair of the Canadian Airports Council, and currently serves as Board Member and past President of the Board of Directors for the Atlantic Canada Airports Association. She also proudly serves as a member of Dalhousie University’s Board of Governors. For more information on the Halifax Business Awards, visit: www.halifaxchamber.com.